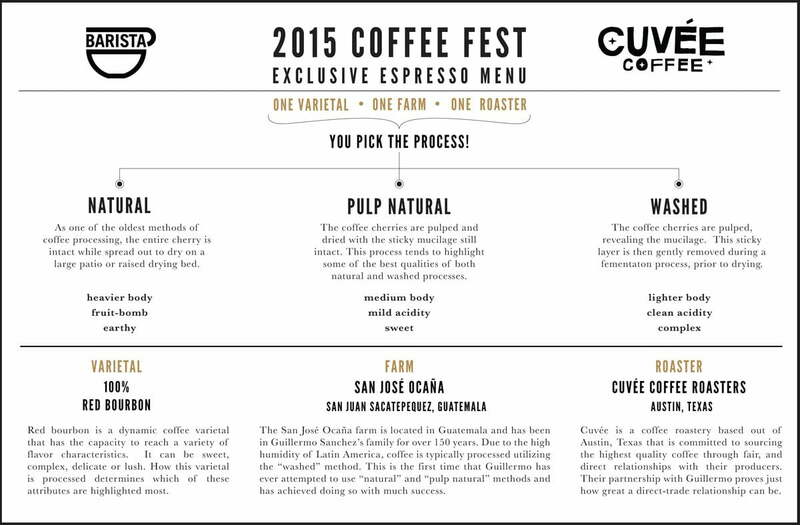 Coffee Fest 2015, the coffee industry trade show, is taking place in Portland this weekend – from the 23rd to the 25th. To mark the event, Barista Coffee is offering an exclusive espresso menu at their shops – a red bourbon coffee varietal from one farm that’s been processed three different ways. Owner Billy Wilson says, “I don’t think anyone has ever had the opportunity to try three different espresso in a retail setting, where the only variable is how they were processed”. The farm is San José Ocaña in San Juan Sacatepequez, Guatemala, and the roaster is Cuvée Coffee Roasters in Austin, Texas. You’ll be able to pick from “Natural”, where the entire cherry is intact while dried, which gives it a heavier body and fruit-bomb earthy notes, “Pulp Natural” in which the coffee cherries are pulped and dried with the sticky mucilage still intact giving it a medium body, with mild acidity and sweet notes, or “Washed” – the coffee cherries are pulped revealing the mucilage, and the sticky layer is then gently removed during a fermentation process, prior to drying for a lighter body, clean acidity, and complex taste. This sounds pretty interesting, and I’ll definitely be dropping by. You’ll know me – I’ll be the guy with the in the corner with the jitters. Category: Coffee. Related posts about Barista Coffee. More about Billy Wilson.